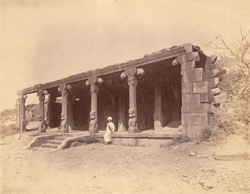 Photograph of the Krishna Mandapa at Mamallapuram, Tamil Nadu, from the Archaeological Survey of India Collections taken by Alexander Rea in the 1880s. Mamallapuram, a tiny village south of Madras, was a flourishing port of the Pallava dynasty during the 7th-8th centuries. The site is famous for an early group of monolithic temples, known as the 'Pancha Ratha' and some monolithic sculptures assigned to the 7th century reign of Narasimhavarman Mahamalla (r.630-668 AD). The Krishna Mandapa is a columned excavation or hall from the mid-7th century. A large sculpture panel depicting the myth of Krishna lifting the Govaradhana mountain to protect the herds and the gopis is carved in the interior.